28 September 2016-The Philippines dropped ten notches in the latest release of the World Economic Forum-Global Competitiveness Report (WEF-GCR), where it landed in 57th place from 47th last year. This is the first time the country dropped in the rankings in the past seven years. 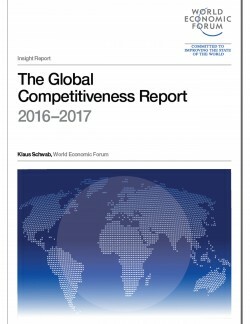 The Global Competitiveness Report is an annual publication of the World Economic Forum that provides a comprehensive picture of productivity and competitiveness by gathering statistical and survey data on over 114 indicators grouped into 12 pillars across 138 countries. The report series remains the most widely-read comprehensive assessment of national competitiveness worldwide. “It is, of course, disappointing to experience this fall in spite of all efforts to improve competitiveness. Our score dropped minimally from 4.39 to 4.36 out of 7 but it was enough to bring us down by countries. The world is so competitive that even small changes make a big difference in ranking,” stated Guillermo M. Luz, private sector co-chairman for the National Competitiveness Council. In the 2016 WEF-GCR release, Philippines dropped in eight of the 12 pillars of the survey. The largest drops were reported in Goods Market Efficiency (down 19, from 80th to 99th); Technological Readiness (down 15, from 68th to 83rd); Institutions (down 14, from 77th to 91st); Innovation (down 14, from 48th to 62nd) and Business Sophistication (down 10, from 42nd to 52nd). On the positive side, the Philippines showed gains in Higher Education and Training (up 5, from 63rd to 58th); Health and Primary Education (up 5, from 86th to 81st); and Macroeconomic Environment (up 4, from 24th to 20th). Macroeconomic management remains the country’s strongest performing pillar in the overall index. The Financial Market Development indicator rank remains unchanged at 48th. “The new ranking brings us further away from our intermediate goal of being in the top-third of global rankings. We will need to focus even more on our challenges – bureaucracy, infrastructure, technology, and innovation – to make the country more competitive,” according to Luz. The World Economic Forum noted the Philippines’ decline in rankings despite negligible drop in the Global Competitiveness Index (GCI) score (4.39 to 4.36). WEF added that the country is in the “flat zone” of the ranking, where many countries are very close to each other in terms of scores. A small variation in the score can result in a big rank shift. Despite the drop in the survey, WEF highlighted the Philippines as one of the three most improved economies in Asia and Pacific since 2007, along with China and Cambodia. The Switzerland-based WEF explained that the data gathering was conducted before elections, and the Executive Opinion Survey was conducted during the campaign period. Download the official statement here.